A client from a pulp mill recently contacted us about replacing the vacuum plate in their lime kilns with high-temperature resistant nylon. They had heard about nylon being used at another mill, and wondered if we were able to do so for them. Nylon can be used for a multitude of purposes and is very resistant to high temperatures. Because it is stronger than steel, and lighter, the decision to switch to nylon in this application was an easy one. Our production team was able to reproduce the vacuum plate out of nylon, saving them the hassle of replacing the part so often due to rust, and also reducing the weight. The newly fabricated parts have made this part of pulp milling much easier, and our customer was very satisfied! 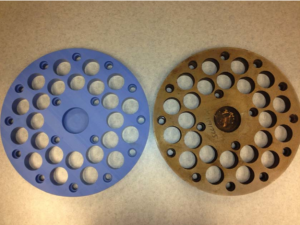 Nylon Vacuum Plate (left) next to the Steel Vacuum Plate (right). Contact Redwood Plastics for more information on innovative plastics solutions.